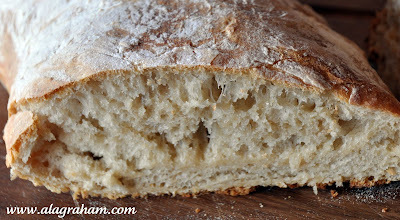 This is a super easy way to make a no-knead ciabatta bread...a hard crusted, soft center Italian bread. All you need is 18 hours...yes, I said 18 hours but that is only for the dough to rise (really it's 20 hours rising time but who's counting)! You can start the day before, say 2pm, let it rise for 18 hours, shape the dough the next morning at 8am, let it rise for 2 hours and then bake at 10am. 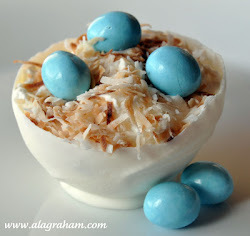 I know that does involve a little thinking ahead but the rest of the recipe is so easy that it is worth it. This is the type of bread I use in the Pan Roasted Salmon with Bread Salad. It should last for about 3 days if you double wrap it in plastic wrap or you could freeze it for up to a month. 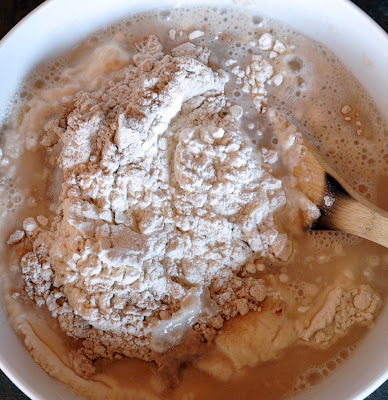 In a large bowl add flour, yeast, salt and warm water. Stir with a spatula or wooden spoon. 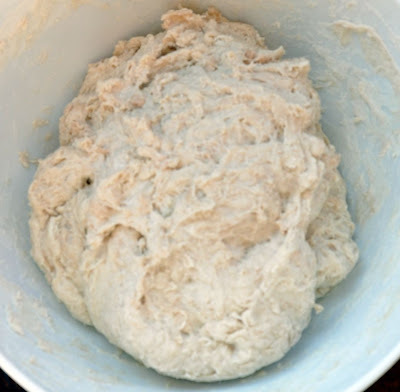 At first the dough will seem too wet, then sticky, then too dry. Just keep stirring until you end up with a very sticky dough. Cover with foil or plastic wrap and let rise for 18 hours at room temperature. After 18 hours, line a baking sheet with parchment paper and dust with flour. Spray an even counter top with a little water and cover with a large piece of plastic wrap (this will cause the plastic wrap to stick to your counter). Dust plastic wrap with flour. 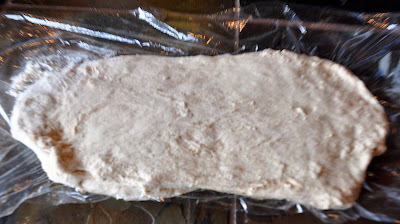 Take a spatula and gently pull the dough off the sides of the bowl and transfer the dough to the floured plastic wrap. Shape the dough into a rough 6x12 shape or make 2 smaller loaves if you want. 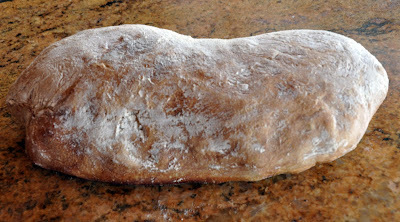 Ciabatta means "Carpet Slipper" in Italian. Pick up the plastic wrap with the shaped dough on it and flip it onto the parchment paper lined baking sheet. Reshape if you need to. (I ran out of parchment paper so I sprayed my baking sheet with cooking spray and then heavily floured it. I highly recommend parchment paper so it doesn't burn. 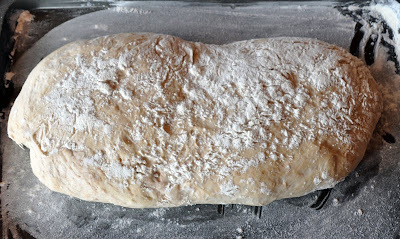 Add a light dusting of flour on top of the dough and cover plastic wrap. 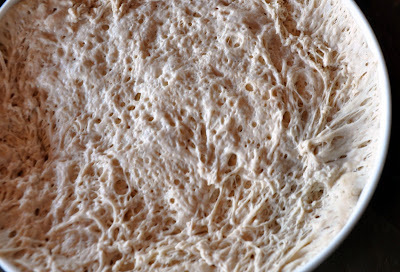 Let the dough sit covered at room temperature for 2 hours. Preheat the oven to 425 degrees. Uncover the dough and bake on the parchment paper lined baking sheet until the crust is a deep golden brown and the center of the loaf registers 210 degrees or about 25-35 minutes. You made this look so simple! I have to figure out how to time this with that 18 hour window though. I love Ciabatta bread. Stop by and leave a comment to win. 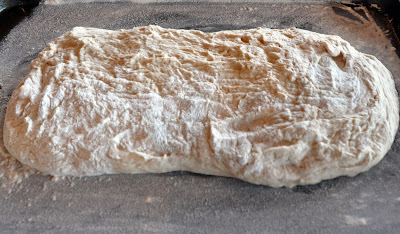 Awesome job on your ciabatta bread. I have always wanted to make it, just haven't gotten around to it yet. Looks delicious. Bella la tua ciabatta!! You konw, the rise is the real secret and your is perfect!! That's very good! Brava!! Wow I love this recipe! Can't wait to make it! Oooh this is a must try for me!! Wow, looks beautiful! This is one of my favorite types of bread, I've never thought to make it. Sounds pretty easy--just requires a little planning. Hi, thanks for visiting my blog. You have some lovely pictures on yours. I'm experimenting with bread-baking this year - it's one of my goals. I love ciabatta - crispy on the outside and soft on the inside - gotta love that! 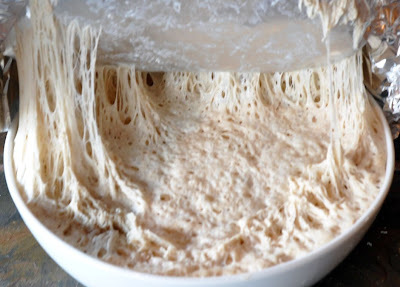 OK, what went wrong.........I got up this morning and looked at my dough and oh my gosh, it was just all bubbles!!! It turned to a "starter like" consistency. I thought what the heck I'll just add a little flour and see if I can't get it back to a dough consistency. I've put it aside now to do that 2 hour rise. Can't wait to see if it turns out. Hope you can tell me why this happened. Thanks so much for answering. You may be right about humidity although with the air conditioning I wouldn't have thought of that. I did go ahead and baked it after the 2 hour rising (which it really didn't do) but it's not eatable!! It tasted like it was not cooked but think that may be because of it not rising properly. I will try again, though. I use bottle yeast by Fleishman's with an expiration date of 2011. Several days ago I made a ciabatta bread machine recipe and it way fine except that it tasted just like regular homemade bread. I have made bread off and on for years with rarely haveing any problems. 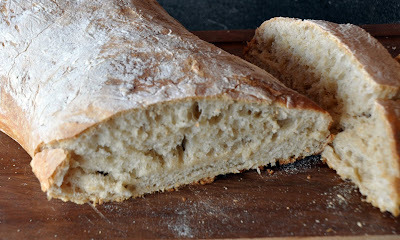 I just dearly love ciabatta bread so thought I'd learn to make it myself. I tried that http address but nothing came up. I'll try again. Thanks again for your help. Success, I got the video. Think the mystery is solved. He mentioned that if it rises too much it will be really bubbly. Sounds like this is what happened. My kitchen my have been too warm so it caused the dough to rise too much. I'm going to try it again tomorrow, put it in a cooler location and see if that works. Will let you know. I tried the bread again yesterday. This time it was perfection!! However, this is what happened. I mixed up the dough around 4:00, looked just liked the photo. I peeked at the dough around 9:00 and lo and behold it had already tripled in size! I thought, well, after what happened the first time, I'm gonna have to put it on a pan and bake it. So I put it on the prepared pan, covered it and gave it the 2 hr rise. It looked just like the photo. At 11:00 I put it in the oven. 30 minutes later, it had risen about 3 inches and was the most beautiful looking bread I've ever seen!!!!!! It looked just like the one in the video and the taste, absolutely supurb!! The crust is crispy while the inside is chewy and light as a feather. Just delicious. I really don't understand why the rising is so fast. This time I used a digital thermometer to make certain the water wasn't too warm, used a plastic bowl rather than my stainless steel and set it next to an air conditioner vent. Anyway, thanks for your recipe and your help. Now I can have ciabatta bread daily!! Shrink wrapping the bread is a good idea.